Foot orthotic devices can stabilize some of the causes of flat feet, optimize muscle function and reduce the occurrence of painful symptoms. Generally, a custom-made semi-rigid functional posted orthotic is effective for flat feet. These devices are prescribed based on a thorough biomechanical examination by a qualified chiropodist/podiatrist. Over-the-counter arch supports may be helpful for mild cases, but often prove ineffective to relieve symptoms associated with flatfoot. Wear shoes with a good fit in the arch. Keep active and fit to strengthen leg and foot musculature. Control body weight to decrease load on the feet. Avoid prolonged periods weight bearing with bare feet. Taping to support strained ligaments and joints. Physical therapy modalities such as ultrasound. Referral for surgical correction a severe symptomatic flatfoot. 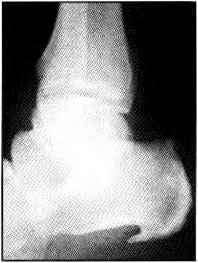 Retrocalcaneal bursitis is the inflammation of the fluid-filled sac (bursa) at the back of the heel bone (calcaneus). The retrocalcaneal bursa is located between the Achilles tendon and the heel bone and is designed to reduce friction between the Achilles tendon and the heel bone. During contraction of the calf muscle, tension is generated through the Achilles tendon and it rubs against the retrocalcaneal bursa. When there is excessive friction due to repetitive rubbing of the tendon against the bursa or high impact force translating through the Achilles tendon, irritation and inflammation of the bursa may occur. The inflammation can also be aggravated by pressure, such as when athletes wear tight-fitting shoes. This condition is often mistaken for Achilles tendinitis but it can also occur in conjunction with Achilles tendinitis.